Book review: "I Am the Clay"
This review first appeared in the North County Blade-Citizen (now North County Times) in 1992. For three decades, Chaim Potok has been, like Kurt Vonnegut, like Norman Mailer, like Hemingway before them, one of those rare writers who transcends the boundary between literature and popular fiction. His first novels, "The Chosen" and "The Promise" were runaway best-sellers. Detailing the lives of ultraorthodox Hasidic Jews in World War II-era Brooklyn, these novels so successfully cut across cultural lines in describing what it is like to be an adolescent rebelling against one's culture without rejecting it that, in spite of their popular sales, they received the critical and academic attention reserved for our most respected works. Potok's subsequent novels have, likewise, focused on different aspects of American Judaism, and all have been written in an open, accessible style comparable to any other best-selling writer's. There is nothing patronizing or trite about Potok's work; he has that rare gift of being able to convey deep, serious thought in clear, everyday language. 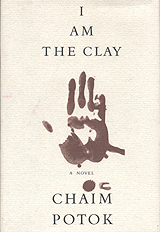 "I Am the Clay" is a departure for Potok on two levels. The most obvious is that "I Am the Clay" is not about Jews, American or otherwise. Indeed, this novel details the lives of three Korean refugees  an elderly couple and a young boy they nurse back from a near-fatal wound  fleeing south during the Chinese offensive of the Korean War. The book is also a departure from his earlier works in that it has a much heavier, darker tone. While far more spiritually inclined than most postwar European fiction, "I Am the Clay" is nonetheless startlingly similar to works by Albert Camus and Marguerite Duras in its stark, barren landscapes and brooding tone of resignation to fate. This is a most un-American novel in that the individuals do not believe they control their own destinies, but are instead unmistakably caught up in forces beyond their control  a situation they accept. A deeply moving book, "I Am the Clay" is certainly Potok's most challenging. And while the brutal day-to-day reality of life as a war refugee and agricultural peasant weighs far more heavily in the book than any references to Korean culture, the book still succeeds wonderfully in capturing the essence of the three protagonists. In order to convey the feeling of being an uneducated peasant whose life has rarely ventured beyond the boundaries of a village of a couple dozen farmers, Potok uses short, clipped sentences and incomplete thoughts. The repetition of daily routines and simple, reflexive religious ceremonies also bring across the limits of life for the uneducated and poor. When confronted with a potential disaster  lack of firewood in the dead of winter, for instance  the characters typically invoke the surrounding spirits or memories of their parents or grandparents. The woman also instinctively makes a sign of the cross her mother learned from missionaries decades ago, not even knowing what it means, hoping only to appease whatever gods control her destiny. A recurring theme in all of Potok's work has been that of reconciliation. In this case, the old man oppose's the woman's adopting of the orphaned boy who is not related to them. Each of the three of them must come to terms with the new situation, without having anything in their life experiences to measure it against. As with all of Potok's novels, pleasure is its own reward  the pleasure of reading a well-written tale of people seemingly very different from ourselves who nonetheless manage to illustrate the important issues in our own lives.